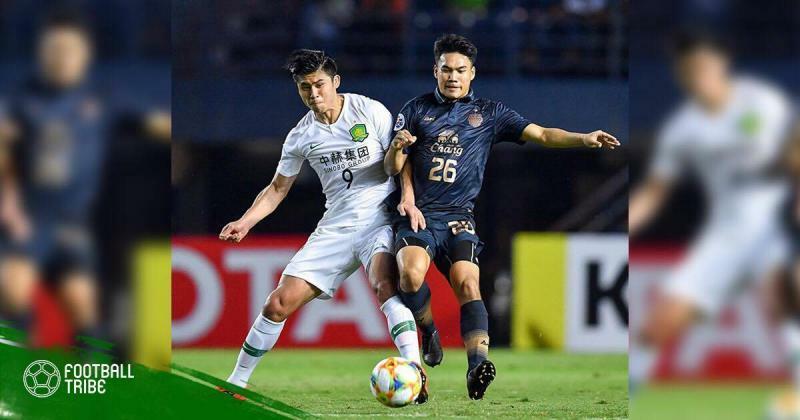 Buriram United failed to utilize their home advantage as they were beaten 3-1 by a clinical Beijing Guoan FC side. Božidar Bandovic fielded an interesting XI in his usual 3-5-2 formation. 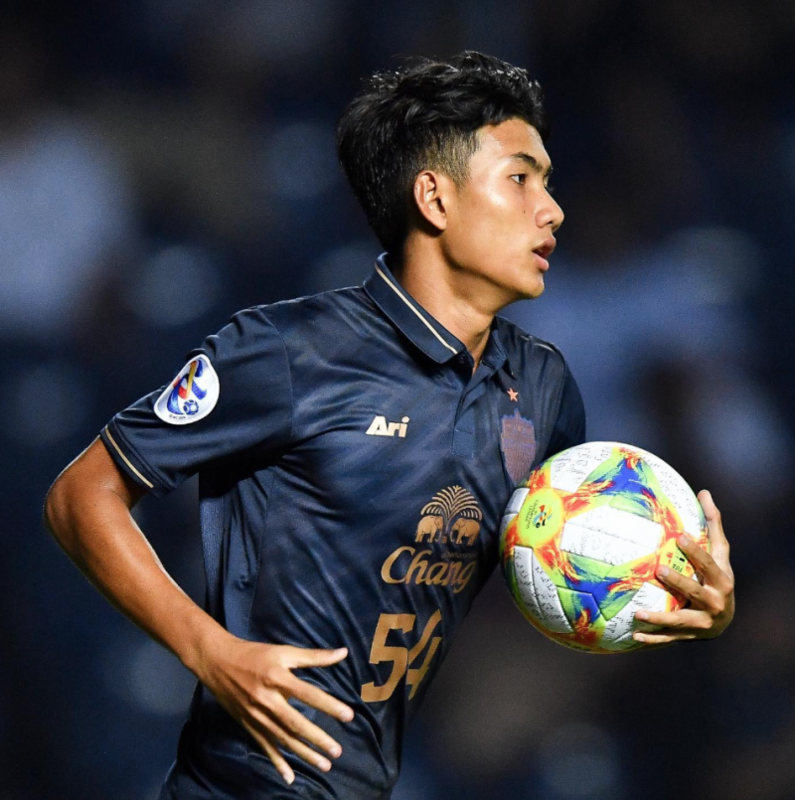 Sasalak Haiprakhon returns to central midfield, as he did in their 3-0 away defeat to Urawa Red Diamonds on Matchday 1. Versatile midfielder Rattankorn Maikami dropped into a right-side centreback in place of the unfit Chitipat Tanklang. Rattankorn played right-back in his youth and excel as a defensive midfielder with the senior team, but this is probably the first time we’ve seen the Thai U23 starting as one of the back-three in a big continental tie. Credits to Bandovic for taking a risk and having faith in young players, but unfortunately that might be the decision which cost him points tonight. The Chinese Super League side started the game with all guns blazing, taking the lead in the 2nd minute through Cédric Bakambu. Fullback Li Lei’s perfectly wiped cross was able to travel across goal because Rattankorn was perhaps half a second too slow to retreat and cover that near post space. Pansa Hemviboon did well to follow his man and was unlucky to be only inches away from Bakambu as the former-Villarreal striker poked the ball in with the outside of his foot. The Thunder Castle had a half chance from Supachok Sarachat’s header but was punished moments later when Renato Augusto broke down Buriram’s right flank before squaring it inside to meet Bakambu’s finish. Once again, Bakambu got away from Pansa with his smart darting run. Although 2-0 down, the Thai champions regrouped well and started the second half with more direction in their play. Buriram United could’ve hit back right from the break when they had a great opportunity to counter in a 3-on-2 situation, but a poor pass by Pedro Júnior let the visitors off the hook. The Brazilian continues to be hit-and-miss in the Champions League for Buriram. The same could not be said about Beijing’s Brazilian import, Renato Augusto, though. The ex-Bayer Leverkusen playmaker, capped 30 times for his country, was definitely the best player on the pitch last night – running the midfield with his vision from the inside-left channel. Renato played 119 passes in total, more than any player on the pitch. Of that, 41 was heading towards attacker Jonathan Viera. The team-up between Renato and the Spanish maestro allowed Beijing to dominate down the left, drawing Buriram’s defensive unit towards them. This opened up space on the opposite flank which Beijing took advantage, as witnessed by the side’s third goal. Renato drove a cross-field pass to Wang Gang. Siwarak Tedsungnoen’s failure to catch the right-back’s cross enabled Bakambu to pounce in his hattrick from close-range. Once again, Bakambu was allowed to sneak in at the near post, this time moving beyond Rattankorn and Andrés Túñez. 3-0 to Beijing after 54 minutes. However, there was a silver lining Buriram United through the impact substitutes Suphanat Mueanta and Luong Xuân Truong. The Vietnamese midfielder released Suphanat in behind the opposition defense with a perfectly weighted one-touch pass. 16-year-old Suphanat made history to become the youngest ever AFC Champions League goalscorer. The wonderkid also holds the record as the fifth youngest player in the competition. After the match, Bandovic praised his young players and how they played, before further acknowledging Beijing Guoan FC’s quality and the fact that his side “has nothing to lose”. The Montenegrin head coach also mentioned Buriram’s early missed opportunity and stressed how a slight slip in concentration against a team of this caliber could be damaging. On a night where the result disappoints, the performance and character of the players shine. In his press conference, Bandovic may be hinting at Rattankorn’s lapse in concentration which led to the first goal, but I don’t think it’s fair to blame the coach or the player. If we are going to criticize Bandovic for having the faith in Rattankorn, then we don’t have the right to feel elated at the rise of Supachok Sarachat, Supachai Jaided or Suphanat Mueanta. The road may hurt but does it really matter that much if it takes you somewhere new, somewhere wonderful? Buriram United are now bottom of Group G with only 3 points. However, luckily for them, Urawa Red Diamonds’s 1-0 defeat to Jeonbuk Hyundai Motors means there is only a small gap between all four sides. Bandovic’s boys still have one home game in hand and if they can get something from the two other away fixtures, there is still the chance of reaching the knockout stage.